What is Weblogic Server ? 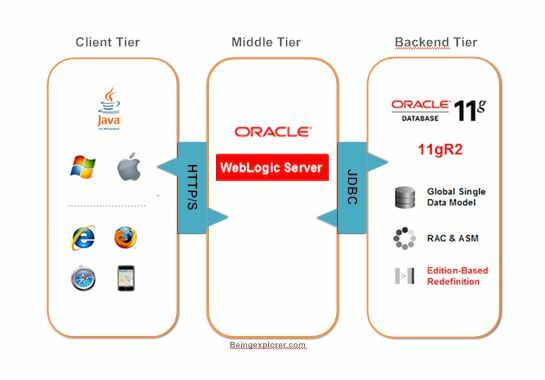 Weblogic server is a java application application server. This is a server that supports various services as well as infrastructure that are related with JEE applications.It is a instance of java process executing in a JVM(Java Virtual Machine). As an application server it exposes business logic to client applications through various protocols, possibly including HTTP and unlike normal Webserver(like Apache, Tomcat..) which just handles HTTP type request, the application server handles business logic of application programs through any number of protocols. So basically Weblogic server is a software application that runs as a middle tire between back-end database and related applications and browser based thin clients. Think of it as a ATM machine with the user acting as browser thin client and the bank as a database from where it fetches your data. Oracle acquired WebLogic Server when they purchased BEA Systems in 2008 ergo we usually call it as Oracle Weblogic Server, but you can still see the name BEA in Weblogic server logs if you are already working on it.